Another week of summer has come and gone...which is sad. But that also means we're a week closer to Michigan football! Here's a rundown of whats making news right now. • ESPN B10 blogger Adam Rittenberg drops an update about Big Ten divisions that could be decided upon as early as this August. Now that we're at 12 teams, creating equal divisions is easy. And it sounds like Jim Delany is eagerly pressing forward. When Big Ten athletic directors gathered in Chicago for their spring meetings in May, they looked at different models for division alignment. Nebraska had been discussed as an expansion candidate, but the ADs didn't anticipate any imminent action, so they played around with the divisions without knowing the potential addition or additions to the league. "We didn’t have names, but we talked about different ways you could do it, depending on the size of the conference," Purdue athletic director Morgan Burke said. Now that Nebraska is joining the league in 2011, the process has accelerated. The Big Ten athletic directors received a memo this week from league commissioner Jim Delany, outlining the priorities and the process for determining divisions. Big Ten associate commissioner Mark Rudner and others are spearheading the project, and will present data to the athletic directors when they gather in Chicago for the Big Ten's media days and kickoff luncheon Aug. 2-3. • OL Stephen Schilling has made his way onto the Outland Trophy watch list [AA.com story]. Schilling has played pretty much every position on the line over his career at Michigan. 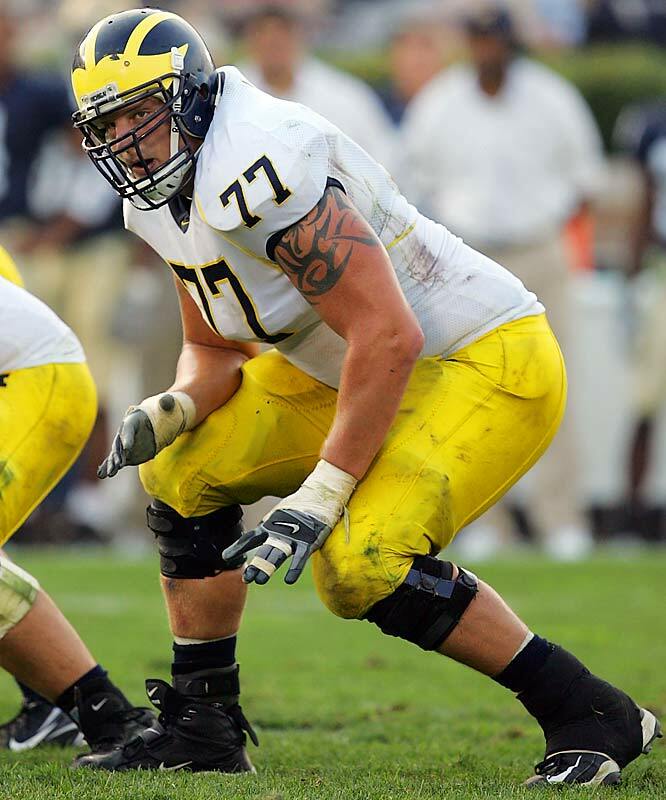 He started at left guard in 2009. The Outland Trophy is presented yearly to the best lineman in the country. Among the 63 players on the list, 9 hail from Big Ten schools. Oddly, Michigan has never had a player win this award. Apparently, this wasn't good enough. 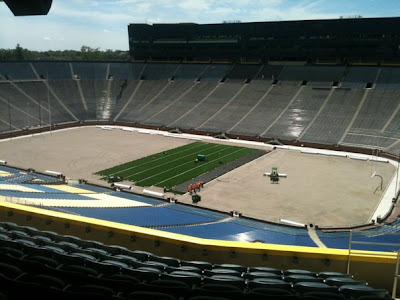 • New turf is going down at the Big House. UMTailgate has posted this pic of the installation. • Maize n Brew talks about Citi ending its long time partnership with the Rose Bowl. Citing reasons for the departure from the Rose Bowl, Citi was not down with the restrictions that ESPN placed on how it could sponsor the bowl game. No official word as to whom will replace them, but AT&T is rumored to be in the mix. • Former Nebraska all-star and current Detroit Lion top draft-pick Ndamukong Suh talks to ESPN about Nebraska's move to the Big Ten. ESPN: What did you think about Nebraska's move to the Big Ten?